Edinburgh, May 17, 2014 (Alochonaa): While much attention was paid to the design and construction of school buildings, little notice has been paid to the design of immediate surroundings of the building i.e. the school ground. 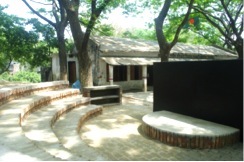 The outdoor environment, the last considered aspect of the school design often remains as the left over space after the construction of the building. Historically the potentials of the outdoor environment have been undermined using it as only the ground for physical training or physical education. This trend is universal around the world. For example, in Australia, large open spaces dedicated to physical activities do not have a proportional number of users and intensity of use in relation to the distribution of children (Malone and Tranter, August 2003). The worst case scenario is the conversion of residences in the city of Dhaka, the capital of Bangladesh to nurseries and primary schools which don’t even have any outdoor play area in the school premise. However, studies in neuroscience has proved the importance of school design on children’s learning. Many adults have mentioned about their outdoor experiences when asked about a significant childhood memory. The impact of this restrained access to the outdoors would cost us much more than we can even imagine. In Bangladesh, we have been stealing the wonderful memory of outdoors from our next generations. Now let us look into the other side of the scenario. What is happening to the children who are treated as passive containers of knowledge delivered by the teachers being captivated within the four walls of the classroom? The recent report published by UNESCO (Global Education Digest 2012) revealed that there is much increase in the net enrolment rate of children in primary schools around the world but a higher percentage of them do not complete their primary education especially in the developing countries. 33% of the children in South and East Asia who enter primary school leave school before completion (UNESCO, 2012). The percentage of drop out in Bangladesh with 104,017 primary level institutions (of which 37,672 are Government Primary Schools) having 19,003,210 children (50.2% are girls) is 26.2 (Mygind, 2009). There are researches on the patterns, causes, changes and policies of primary drop-out but the aspect which is always missed out from the scene is the quality of physical environment. Many attempts are taken different time to attract children to school offering them different incentives- food, school uniform, stipend —which possess a short term impact. But has it been ever thought to approach this overarching problem from a total different perspective? What can be done to motivate the children to come to school which can have a much longer term benefit? We always approach any planning or design from an adult’s perspective. What if we look into this problem from a child’s viewpoint trying to know what actually children like in their schools? I have asked 30 children from 3 different schools in the city of Dhaka about the most liked space in their school. What I have learnt is the most favourite place of the children is the outdoors and most of them come to school because they can play with their peers and spend time in the school ground. Though the survey was undertaken in the urban areas; literature shows that universally children are fond of places with sufficient variety in the environment, and with natural elements such as grass, trees, gardens and parks (Martin et al., 2013) . In rural Bangladesh children lead a more free life in the outdoors except the time they have to spend inside their classrooms. In the poorly lit and ventilated over-crowded classroom they seem like the Royal Bengal Tiger captivated in zoo. What measures can be taken that can make this children free from this prison and give them the taste of learning in a joyous environment? The answer is very simple- yes; their learning can be extended from the classroom to the outdoor. We can give them a classroom with sky for a ceiling and earth for a floor, a room without walls or desks. An outdoor classroom can be so resourceful for children where young scientists can explore the life-cycle of frogs; mathematicians can measure wind-speed; budding writers will record what they observed; and actors will rehearse on a natural stage! According to psychologists, children of this age (primary school children aged 6 to 11 years old) learn best through exploration and experimentation- when their lessons are integrated with the context they live (Mårtensson et al., 2014). One of the central tenants of the Montessori philosophy is the connection with the natural world of the outdoors which is practised all over the world. 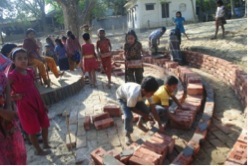 In order to investigate whether the practice of outdoor learning having a positive impact on the children of the developed world can also benefit the children in developing countries I have designed and constructed an outdoor classroom in a rural primary school of Bangladesh in 2012. The project was funded by BUET and conducted as a part of my M.Arch dissertation under the guidance of Dr M Zakiul Islam, an N.C. State University Alumni and my colleague in the Department of Architecture, BUET. The children and the teachers of the school willingly participated in the experiment. 30 children of class IV (Age 8-9 years old) have been taught two consecutive chapters of their science book respectively in indoor and outdoor classroom by the same teacher. Their learning outcome after being taught in two different settings has been measured through tests. Statistical analysis of the scores the children have attained in the tests have showed a significant improvement in children’s learning of science after they have received their lessons in the outdoor classroom. “All the elements we learn such as trees, animals, soil, air, water etc are around ourselves in nature which the teachers can explain us with examples while teaching in outdoor, we have everything in our reach” said Jerine and Swapna, two children of class IV, “We feel comfortable and learn easily the lessons of science which seemed very difficult in our classroom” in response to my query in a focus group discussion with the children about their learning in the newly built outdoor class. The children feel more motivated in learning. 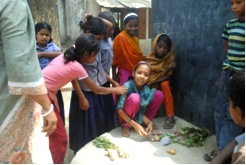 Their science teacher Ms Shikha Rani said, “The children are spontaneous and enthusiastic in their outdoor class. They work in groups and our attitude towards teaching is also changed while we teach in outdoor class.” From a focus group discussion with the teachers it is learnt that even the most inactive child in the classroom participates in some activities in the outdoor class. Children are never absent on the day they are taken to the outdoors. The local masons have been employed to work with me to build the outdoor classroom, yet the children enthusiastically engaged themselves in the construction. They helped in curing the bricks before and after the construction, carrying the bricks to the construction site. This active participation in the development process created a sense of belongingness in them for their outdoor class. They don’t use the space only for formal science class. One morning I was passing by the school on a sudden visit to the village, I found the girls playing in their outdoor classroom different structured and non-structured games having interesting names like O dear friend (বান্ধবীগো), singing with the last word (গানেরকলি), lemon lemon (লেবুলেবু) etc. Previously, they could not play and have time outdoor as the school ground is mostly occupied by the boys. They invited me to their class of extra-curricular activities which now a days is held in the outdoor class. It’s like an open theatre – the children perform on the stage where the audience along with the teachers enjoy sitting in the stepped seating. The world is just a few steps back from the promise to fulfil every child’s right to primary education by 2015. The primary schools are reaching more students but losing them due to various inefficiencies. According to UIS director, “It is far more difficult and costly to reach children once they leave school than to address the barriers and bottlenecks in the systems”(Ahmed, 2012). This small study was an effort to look into the problem from a different perspective. It has proved the impact of the outdoor environment on children’s learning in the context of a developing country, yet further researches are required to make the evidence stronger and put the ball on the ground for rolling. Policy-makers, environmental designers, researchers, educationalists should come forward to make this happen, to ensure ‘education for all’ for our future leaders. In order to continue this journey I have started my PhD in Landscape Architecture in the University of Edinburgh, UK in September 2013. As part of my PhD, I am planning to design and develop the landscape of two more primary schools in Bangladesh and investigate the impact of the outdoor in children’s motivation and learning in a longer term study with my supervisor Dr Simon Bell. Due to time and budget constraint we could only construct a seating area for children as their outdoor classroom previously but a well-designed school landscape has much more to contribute towards children’s total development. I am following an evidence-based strategy to find out various settings in the outdoors conducive to children’s learning and will finalize the design in a workshop with the primary school teachers. The development process will begin on site from October 2014 and now we are working on collecting funds for the development works. The smiling faces of the children that I will be able to see after the development of the school ground is the motivation for me throughout these stressful days of my overseas studies. *Matluba Khan is an Assistant Professor in the Department of Architecture, Bangladesh University of Engineering and Technology (BUET) and currently on study leave for her PhD in Landscape Architecture in the University of Edinburgh, UK. She is interested in built environment research specially creating better environment for children aiming at their learning, health and well-being. AHMED, B. 2012. UNESCO report signals to high dropout rates in education. Available: http://southasia.oneworld.net/news/unesco-report-signals-to-high-dropout-rates-in-education#.U1ggZvldVI4 [Accessed 23/04/2014]. MALONE, K. & TRANTER, P. J. August 2003. School Grounds as Sites for Learning: making the most of environmental opportunities. Environmental Education Research, 9. MARTIN, M. O., FOY, P., MULLIS, I. V. S. & O’DWYER, L. M. 2013. Effective Schools in Reading, Mathematics, and Science at the Fourth Grade. TIMSS AND PIRLS 2011: RELATIONSHIPS AMONG READING, MATHEMATICS, AND SCIENCE ACHIEVEMENT AT THE FOURTH GRADE—IMPLICATIONS FOR EARLY LEARNING. MYGIND, E. 2009. A comparison of childrens’ statements about social relations and teaching in the classroom and in the outdoor environment. Journal of Adventure Education & Outdoor Learning, 9, 151-169. MÅRTENSSON, F., JANSSON, M., JOHANSSON, M., RAUSTORP, A., KYLIN, M. & BOLDEMANN, C. 2014. The role of greenery for physical activity play at school grounds. Urban Forestry & Urban Greening, 13, 103-113. UNESCO, I. F. S. 2012. 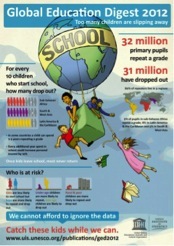 Global Education Digest 2012.